Mitchell Martin represents clients in a wide range of litigation, including matters concerning: employment, construction, personal injury, professional liability, and products liability. He has also advised clients in cases involving complex class actions, bad faith, medical device and qui tam litigation. 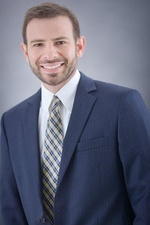 Mitchell is involved with all phases of the litigation process, and has obtained favorable results for his clients in numerous cases including dismissals, summary judgments, and changes of venue. Before joining Hinshaw, Mitchell was an attorney with a St. Paul-based, complex litigation firm where his practice focused on insurance related litigation and toxic torts. Previously, he worked as a litigation attorney for a regional firm in Illinois. During law school, Mitchell worked as an intern for the Honorable Lloyd Karmeier, Chief Justice of the Illinois Supreme Court. In addition to his other law school accomplishments, he was the recipient of the Judge Richard E. Richman Endowed Scholarship; received CALI Awards for the highest grades in Legal Research and Writing and Trial Advocacy; and was named to the Order of Barristers. Mitchell also competed as a member of the National Moot Court Team during law school and received Best Brief, Best Oralist, and finalist awards. In his free time, Mitchell enjoys singing, running, hiking, and being active in his church.